I have been knitting my Deep and Unrelenting Caramel for what seems to me about 5 months now. In reality it has only been 2 months but it seems soooo much longer. And why does it seem like it is taking forever? 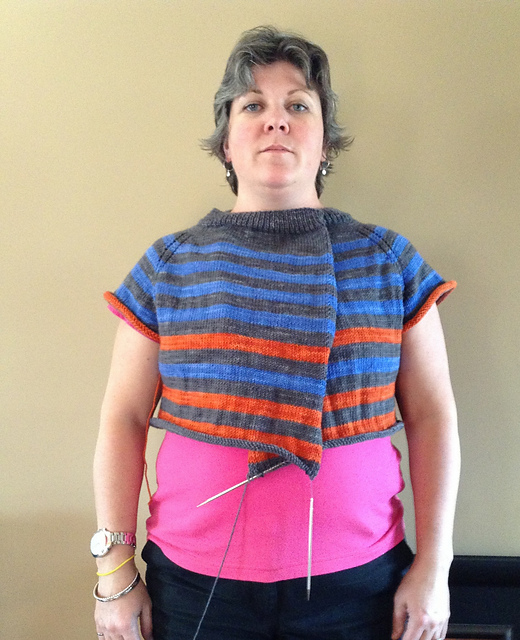 This top-down open cardigan is knit in one piece, which makes for some very long rows. I've separated for the sleeves and now I am well under each arm but each row is still taking me about 20-30 minutes to knit. Yes, you read that correct... 20 to 30 minutes PER ROW. OMG this sweater is going to take forever to knit! Part of the problem is that I am a slow knitter and I don't have a lot of time to knit each day; I consider myself lucky if I get 30 minutes a day to devote to knitting. And, as I said, the rows are very long. (I'm a thrower not a picker.) But I think that this is only part of my issue. I think I really need to change needles. When I first started knitting I bought the best set of needles that I could both find and afford. I didn't have much choice at my LYS but I was very happy with my purchase of a set of plastic circular Denise Interchangeable Needles. I recall that they cost me about $75. I have used these needles over and over again for many years now. And until now I have never had any complaint. I'm not sure when it started but I recently started noticing things that I didn't like about these same needles that I had used a hundred times before: the flexibility and dullness of the tips and my current issue- the thickness and stickiness of the cord. 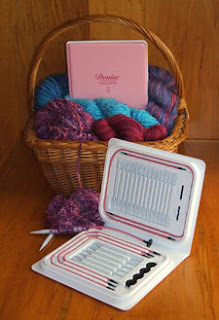 I think that plastic needles are absolutely fabulous for a new knitter. They do exactly what you need them to do: hold your stitches in place very securely as you fumble your way around the needles. At some point along the way I transitioned from needing my stitches held where I left them to wanting them to slip and slide along faster. One of my favourite Canadian knit bloggers, Miso Crafty Knits, did a series of reviews of needles recently. (Here, here, and here) I found her reviews very thorough and thoughtful and this really got me thinking about what needles I use and why. So today I made the leap. I splurged and bought myself a new set of addi-turbo click Lace-Long tips. They are circular interchangeable needles with long, sharp tips. The cords come in a variety of sizes and are of small diameter, even as compared to the smallest needles in the set. The cords are also very flexible. I am very happy with my purchase! Now let's see if they help me move any faster on my sweater!